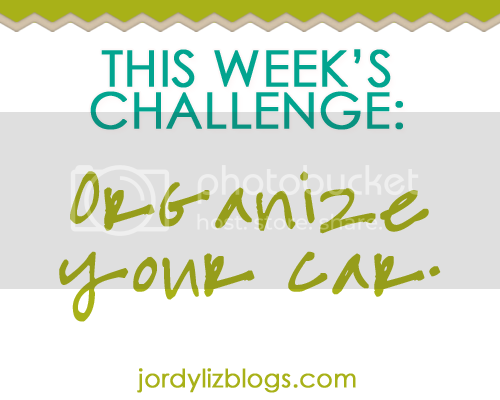 Jordy Liz Blogs: Organizing Life: Your car. This week, I organized my car. I am in my car several times a day going to and from work, to and from the house, to and from errands. Eventually, it fills up with junk from all these different journeys and items get left behind because I don't feel like bringing them in. It was time to clean it out. I took everything out, decided what needed to go into the house and what could stay in the car. There are very few items I actually need in my car, so I made sure I was selective. And of course I managed to not take any pictures of the process. Who am I? Regardless, picture a big basket with a bunch of stuff in it that all ended up in the trash. My commutes will now be much calmer and peaceful without the extra baggage. How did you do? Link up your post below! This is a good habit to get into now (cleaning out your car), because when kiddos come along, the car junk BREEDS! I can't figure out where it all comes from --toys, food wrappers, water bottles, hair bands, craft projects... YIPES! I better go clean out my car! A clean car does make all the difference!